I just finished reading an article about actor Will Smith, in the current issue of TIME. What a story! What an example of purposeful living! I already liked his movies. Now, I like the man. Why? In an error where everything that goes wrong is someone else's fault, this young man seems to recognize that he has the power to make things go right. Maybe not all the time, but often enough that life is good. There are some habits described in this article that we could all learn from. If we could instill these habits in our youth, we'd have a lot less crime, a lot less drop outs, and a lot fewer worries for their future. Today's Chicago SunTimes reports the tragedy of a University of Chicago graduate student from Senegal, Africa, being shot and killed by teens living in the area around the University. This is not the first time such a tragedy has taken place in Chicago. Click here to be reminded of previous stories. What I'd like to know is why the news media have not yet made the connection to the rich University and the University of Chicago Hospitals, Presidential candidate Barack Obama, and his wife Michelle, who as I recall works for the University of Chicago Hospitals, and the lack of significant strategic involvement by the university and its alumni to support the growth of comprehensive, mentor rich, career focused, neighborhood youth programs that might have provided an alternative path for the three young men who chose to go on a crime spree last week. I've been building a database of volunteer-based tutor/mentor programs since 1993 and sharing this information with many information, including the Obamas and others at the University of Chicago. I've been trying to encourage leadership from the university and the hospital that would lead to more and better tutor/mentor programs in the neighborhoods around Hyde Park (60637) where the university is located. If you search for the 60637 zip code in the Tutor/Mentor Program Locator, looking for programs that define themselves as a "mixture of tutor/mentor programs", you'll only find three groups in this area. One is The Blue Gargoyle, located near the University of Chicago. For many years I've received calls from parents and social workers on the South Side of Chicago who were looking for tutor/mentor programs in the area. Many had contacted the Blue Gargoyle first, who then refered callers to us since they could not fill the demand themselves. You can search a map version of the program locator for the zip codes around 60637, and you'll see that there are very few volunteer-based tutor/mentor programs. This has been an issue for many years. 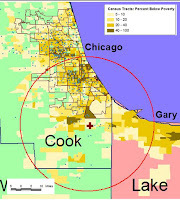 Thus, my question is, what's Obama's track record, or what's the university's track record, or strategic plan, for helping more and better tutor/mentor programs grow in this part of Chicago, using the resources of the University, the Hospital, and the rich and powerful alumni of both institutions. My belief is that if there had been a strategy since 1995 when I begin communicating this information to the hospital and university, and other business leaders in Chicago, there would now be many more tutor/mentor programs in the area, and some of these would be the best in the country (based on the quality of thinking and resources that the university could bring to bear on this issue, using the proposed on the T/MC web site). Is there a strategy? Do any of the candidates have a strategy? Let's Redefine Christmas by Putting More Thanksgiving in It. Today's Chicago Tribune include a full page ad that encourages people to consider giving gifts to charity, rather than to each other. I saw this ad a week ago and was going to write about it. Anyone willing to spend this kind of money to encourage philanthropy is a hero to me. However, the first ad apparently used the word "loathsome" and that generated negative feedback. Thus, the second version was rewritten. Eric Zorn wrote about this in his column today, which is what prompted me to take another look. When I first saw this ad I wondered who sponsored it, and there was some small type saying The Dolio Family Foundation does not solicit donations from the public. In his column today Zorn interviewed Matt Dalio, on behalf of the Dalio Family Foundation, the sponsor of the $2 million campaign. This gave me a greater appreciation of the goals behind the ad. If you've read my blog in the past you know how much I'm trying to recruit leaders who will use their visibility, and their wealth, to generate more consistent year-round support for tutor/mentor programs. I don't have an advertising budget, thus having someone like the Dolio Family Foundation step forward and spend their money is great news for me. I only have one wish. I'd like to have seen them provide a link to a web resource where people could find a list of charities to support, such as you'd find on www.networkforgood.org or www.change.org. Furthermore, I love to have them review the Program Locator which the Tutor/Mentor Connection is piloting. 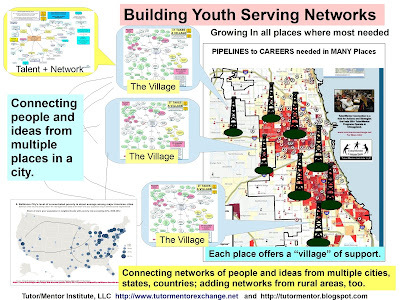 This is intended to help tutor/mentor programs grow in all poverty neighborhoods, by teaching donors to look at maps showing all the places where programs and donations are needed, then choose what section of the city, or what zip code, they want to help. Once they have made that decision they can search the Program Locator by zip code, and type of program, age group served, and time of day service is provided, to narrow down their search. This only leaves a few choices in most neighborhoods. If systems like this were used, the small charities operating in neighborhoods without the high visibility of a Cabrini Green, or a Robert Taylor Housing Development, would have a better chance to get consistent funding and this would enable more comprehensive tutor/mentor programs to grow in all parts of the city. If leadership like that provided by The Dalio Family Foundation helps long-term charities grow in high needs areas, their gift will have a lasting effect. So will yours. One of the themes of every Tutor/Mentor Leadership and Networking Conference is volunteer recruitment and retention and one workshop was a panel discussion hosted by leaders of three different Chicago programs. Nicole White wrote about this and included a few photos at this blog. For programs to provide a high level of customer service, they need to find ways to recruit and retain key leaders who understand the goals and strategies of their program, can build relationships with youth and volunteers, and are able to support the individual needs of each youth and volunteer as the tutoring year moves from September through June. I feel one of the challenges of going to scale, or of having hundreds of high quality volunteer-based tutor/mentor programs is the difficulty of finding experienced leaders for many different tutor/mentor programs, and to keep these leaders in place for 5-10 years. One obstacle is lack of consistent, or adequate funding. Many tutor/mentor programs, including Cabrini Connections, work shoestring budgets, thus staff wear many hats, work many hours, and often work with hand-me-down equipment that is not always in good working condition. It's hard to keep good people in these jobs when their skills are so highly valued in the for-profit world. You can help change that with year end donations, and charitable bequests, to support tutor/mentor programs in Chicago, or in other communities. However, a second major challenge is that I don't know of any university that is preparing graduates for careers specifically in volunteer-based tutor/mentor programs. 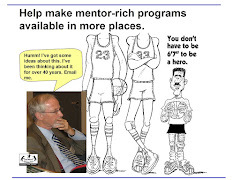 If young people apprenticed in tutor/mentor programs as they moved through high school and college, and they took courses in communications, marketing, leadership, as well as education, youth development, psychology, etc., they would leave college ready to take mid level and leadership roles in tutor/mentor programs. Or they might leave college and go into industry, more aware of their pro-active role as a leader and donor in support of individual programs. If you're thinking of a place to leave a fortune, why not consider a bequest to a university to set up such a training program? It could have an impact all over the country. Today there is a story in the Chicago Tribune showing how funds provided by the government via the No Child Left Behind Law are taken away once a school improves its test scores. This is the thinking that got us into Iraq without a plan to win the peace. In most neighborhoods with poorly performing schools, poverty is the main problem, or English as a Second Language. Just because a school improved test scores does the government think poverty has gone away. It would be great if NCLB were also focused at reducing high school drop outs, or preparing youth for 21st century careers. Then maybe the funding would be more flexible and would continue for decades, not just a few years. If you've read my blog previously you'll see that I feel a volunteer-based tutor/mentor program should be viewed by business as a workforce development strategy. Volunteer involvement provides learning and networking experience for current workers, and it can help build a pipeline to careers for future workers. We host a variety of information on this subject on the T/MC web site, and host a conference every six months to draw people together, and to build visibility for tutor/mentor programs throughout the Chicago region. I've asked people who attended the conference last week to write about it. Read Keith's blog and you will see a few more photos and a few more reasons to get involved with the Tutor/Mentor Connection. If we can get business to think strategically about tutor/mentor programs, we can innovate new sources of long-term revenue, and reduce our dependency on short sighted (and limited) public funding. On Thursday, Nov. 15, Marcus Sullivan, former football star at the University of Illinois, and in the National Football League, helped open the Tutor/Mentor Leadership Conference. By their participation, they help us draw volunteers and donors to all tutor/mentor programs in the Chicago region. Using the Program Locator, anyone can choose where they want to be involved, and what programs they want to support. As we approach the year end holidays, we hope you'll all use this resource to make a donation to one or more tutor/mentor programs in the Chicago region. On Friday, Bruce Herron, who wore #51 for four years as a linebacker, for the Chicago Bears, talked about the importance of teamwork, in sports, and in life. 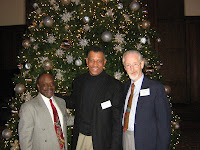 In this photo Bruce is shown with Daniel F. Bassill, President of the Tutor/Mentor Connection, and LaMarr Johnson, Labor Market Outreach Specialist, IL Dept. of Employment Security. LaMarr has been a speaker at the past two conferences, and introduced a new State of Illinois web site intended to help young people plan for careers. LaMarr, Bruce, Marques and everyone who attended the Thursday-Friday conference, are part of a growing team, a network of purpose, working to help volunteer-based tutor/mentor programs grow in the Chicago region. In the next few weeks we'll post additional photos from the web site, and talk more about how hospitals, pro sports teams, tutor/mentor programs, lawyers, colleges and youth can work as a team to help young people from economically disadvantaged, and socially isolated parts of America have the expanded network of support they need to succeed in school and move to careers. Join us on-line to be part of this team. Send your donations to help the T/MC do this work. I'm at the Olympia Fields Country Club in Olympia Fields, Il. This is where we're hosting the Tutor/Mentor Leadership and Networking Conference. This is the 28th time I've hosted this conference since 1994, and I still get jitters,hoping everything will run smoothly, enough people will attend, and that participants will get value from attending. Yet, I know from past experience that I've done all I can. It's now up to those who attend to make this conference and this networking work for them. I know from past experience, that just one or two contacts out of a face to face conference can lead to major impacts on an organization. For instance, in the first conference we started our relationship with lawyers and judges of the Chicago Bar Association. That's led to a Lend A Hand Program that now mobilizes lawyers and judges to be part of tutor/mentor programs all over Chicago. It also raises money to help fund these programs. Yesterday was the annual meeting to review grant requests. Almost $200,000 was awarded to different tutor/mentor programs in Chicago. In another conference, around 1998, I met Steve Roussos. Steve was a PhD student at the University of Kansas and had contacted me saying "I'm coming to Chicago. Can we meet?" I asked when. He said November. I said, "will you do a workshop?" He did, and we've been working together ever since. 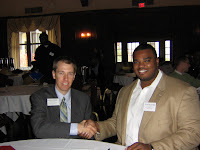 In another conference, in around 2000, I met Scot Evanbeck, Dean of University College at IUPUI, in Indianapolis. The http://www.tutormentorconnection.org web site was re-built by IUPUI in 2005 as a result of the networking and collaboration that resulted from that first meeting. In the T/MC OHATS documentation system I've documented actions and networking that has taken place since 1999. Through this you can see how the conferences play a role in bringing people together, share knowledge, and enable each participant to use this knowledge to build their own program, start a new program, or support a citywide strategy of multiple programs. It's showtime! Got to get dressed and help set up. If you're in the area, why not drop by. If you can't make it, why not join us in the forums on the T/MC web site. I was searching Google tonight for articles about mentoring that related to workforce development and found this one titled Mentoring Makes a Difference. The writer makes a strong case. The question I ask you is, what do we need to do to make effective mentoring programs available in more high poverty neighborhoods, so more kids can participate? That's a primary reason I invite people to come together every six months for conferences,such as the one we're holding on Thursday and Friday, and to read this blog, or to visit the TMC web site. If we agree mentoring makes a difference, then let's put more time into making mentoring available to more kids. Marques Sullivan, former college football star at the University of Illinois and National Football League will be one of the speakers helping to kick off the 28th Tutor/Mentor Leadership and Networking Conference, to be held November 15 and 16, 2007 at the Olympia Fields County Club in Olympia Fields, Il. Marques Sullivan was a multi-sport athlete at Fenwick High School in Chicago, achieving All-America honors in football during the 1995 season. He was an All-America football player at the University of Illinois and then played for the Buffalo Bills, New York Giants and New England Patriots between 2001 and 2004. Having grown up in inner city Chicago, he understand the importance of mentors and coaches in the lives of young people. He is currently involved with many charities in the Chicago area. Learn more about the conference at http://www.tutormentorconference.org. There is still time to register. Network Building - Can you do it? Today on the Smart Communities blog Suzanne Morse wrote about the Tutor/Mentor Connection, drawing from a comment I'd posted on her blog previously. We were introduced to each other about a year ago via the Non-Profit Blog Exchange . This illustrates how people who care about the same issues can each voice their opinions, using their own blog, and connect their networks to each other, via blog exchanges. If more people do this every day, we'll soon have an army of people working together to help disadvantaged youth. We're holding the next tutor/mentor conference next week in the South Suburbs of Chicago. 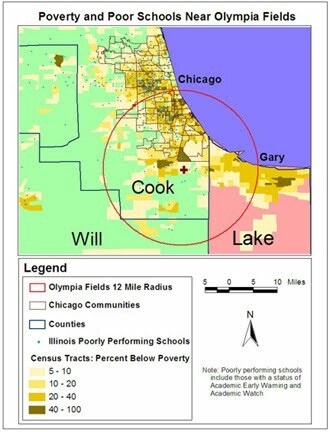 The map shows that within a 12 mile radius of the Olympia Fields Conference site there are many areas of high poverty where tutor/mentor programs are needed. We hope leaders of programs that already operate in this region, and in other parts of the Chicago region, will attend. But we also want other leaders to attend. Our goal is to create a convergence, of business, health care, universities, faith groups, k-12 educators, social workers, lawyers, etc., ... all focused on expanding the learning and mentoring network for k-12 kids living in poverty, with the idea that volunteer-based tutoring/mentoring programs can be a more important strategy to business, hospitals, faith and university leaders. While we expect leaders of some tutor/mentor programs to attend (see the attendee list), we're not yet getting leaders of business and health care organizations to participate. We know some CEOs understand how volunteerism can be a valuable form of workforce development, and how some health care leaders understand mentoring as a workforce development strategy, however, getting these people into an on-going conversation that turns them into leaders of the Tutor/Mentor Connection's strategy, is not yet happening. Part of the problem is that most business people don't even know the Tutor/Mentor Connection exists. Those that do are too busy to attend our conferences, or to far from Chicago to attend. This is true for tutor/mentor program leaders, too. Thus, we've been working to move this networking to the Internet. In the past year more and more social network spaces have become available, which enable people who care about a cause, to connect with others who care about the same cause. We've created discussion forums on the T/MC site. But we also have space on Linked In and Facebook. In addition I participate in forums hosted by others, such as the Learning to Finish Wiki, and the Classroom 2.0 community. At MyHealthCareer.net we've started a new outreach with health care professionals. Each of these communities connects the T/MC to a growing network of others who care about kids just as much as we do. If we can turn this network into a network of purpose, we can solve problems facing non profits, and do more to help kids. Building collaborations and partnerships and focusing them on long-term goals is a difficult process, in the best of circumstances. I've been building this network for the past 30 years, informally at first, with limited support from foundations, or government. Yet over time we've helped many people build tutor/mentor programs, and many volunteers connect with kids. Here's a timeline that illustrates this growth. Some where in America, today's papers will report stories of kids being killed, schools that perform poorly, poverty, and other social injustices. If you read one of these, I encourage you to join us in one of the forums I've listed, so you can learn ways you can be part of the solution, or that you can connect your network so they can be part of a solution. We can become angry about a problem, and hope someone else solves it. Or we can begin to learn more about the problem and become a catalyst who helps make it go away. Halloween Tragedy. Education Gap Grows. How to respond? Last week's headlines included a tragic story of a young mother who was shot and killed as she was out trick-or-treating with her three young kids. It was a random shooting, gang related, and too common in Chicago. As tragic as this was, it did not get as much of a headline as the reports from the most recent round of education test results, showing a continuing gap between the learning or rich and poor in Chicago. The question is, "who cares?". Do you see the stories of shootings so often that you just read past them? Is the education gap something that is "somebody else's problem"? The reason I advocate for volunteer-based tutoring/mentoring is that it connects people who don't live in poverty, who have never had to fear for their life as they go to school every day, or walk in a park, or take their kids out for Halloween, on a personal basis with kids and families who deal with these issues every day. If we can help volunteer-based tutor/mentor programs like Cabrini Connections grow in every part of the Chicago region where there are pockets of poverty, we can connect thousands of people with this tragedy and, hopefully, increase the number of people who don't put the paper down when they read these stories, but dig deeper for meaning and understanding, and look for ways to stop this killing. I write about this often and encourage you to scroll back through the past messages that I've posted. I also encourage you to try to participate in the next Tutor/Mentor Leadership and Networking Conference, which will be November 15 and 16. If you can't attend personally, then join us on the Internet, in the T/MC forum, on Facebook, or in other spaces where we can stay connected for many years, or as long as it takes to develop a more sophisticated, and broad based, response to these tragedies. As you move through the coming week, and read more stories like these, I hope you'll remember this invitation.